Joint Formula vs other supplements - a fair comparison? Joint Formula vs other supplements – a fair comparison? 1. Most joint supplements for animals contain MSM, Glucosamine and Chondroitin sulphate. A few add some extras such as Vitamin C or a mineral or two. Within these three main ingredients, dosage levels differ, prices differ and the form of ingredient differs. These were the only three ingredients included in our stockist’s table. Glucosamine can be various forms – hydrochloride, sulphate, and N-Acetyl- Glucosamine. All three forms have recently been shown to be equally effective. Chondroitin sulphate is obtained from either cow, pig, bird, fish or shark cartilage. The lower the molecular weight (smaller) the Chondroitin molecule is, the better it is absorbed. At The Herbal Pet, we don’t use Chondroitin sulphate at all. Why? It is not very readily bioavailable. Which mean that a lot of it is not absorbed orally. Researchers estimate that, at best, only about 15% of an oral dose is available to the body. 2. The other reason that I felt my stockist’s comparison table was unfair was that we use other ingredients, besides the standard MSM, Glucosamine, Chondroitin. 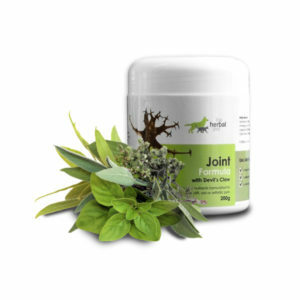 In Joint Formula, for example, we use, amongst others: MSM, Glucosamine, Fenugreek, Phytosterols and Devil’s Claw. Two Indian studies have found that Fenugreek significantly improved arthritis in rats. The one study proposed that this effect was due to Fenugreek’s anti-inflammatory and anti-oxidant activity. The number of studies that have found Phytosterols to be beneficial to joints is staggering. I have only cited a few here. The anti-inflammatory effect of Devil’s Claw is probably due to a molecule called Harpagoside. Several studies have found this herb to be as effective as NSAIDs. So, to sum up, our supplement may not have looked as concentrated as our competitor’s did. But I am willing to bet that it would outperform all of them. Reichenbach S, Sterchi R, Scherer M, et al. Meta-analysis: chondroitin for osteoarthritis of the knee or hip. Ann Intern Med. 2007;146:580-590. Monfort J, Martel-Pelletier J, Pelletier JP. Chondroitin sulphate for symptomatic osteoarthritis: critical appraisal of metaanalyses. Curr Med Res Opin. 2008 Apr 15. Wandel S, JÃ¼ni P, Tendal B, et al. Effects of glucosamine, chondroitin, or placebo in patients with osteoarthritis of hip or knee: network meta-analysis. BMJ. 2010;341:c4675. Andermann G, Dietz M. The influence of the route of administration on the bioavailability of an endogenous macromolecule: Chondroitin sulphate (CSA). European Journal of Drug Metabolism and Pharmacokinetics. January-March 1982, Volume 7, Issue 1, pp 11-16. Suresh,Ch. N. Kavitha,S. Manohar Babu, V. Prabhakar Reddy, A. Kanaka Latha. Effect of Ethanol Extract of Trigonella foenum graecum (Fenugreek) Seeds on Freund’s Adjuvant-Induced Arthritis in Albino Rats. Inflammation, August 2012, Volume 35, Issue 4, pp 1314-1321. Sindhua, M. Ratheesha, G.L. Shynia, Bala Nambisanb, A. Helen. Anti-inflammatory and antioxidative effects of mucilage of Trigonella foenum graecum (Fenugreek) on adjuvant induced arthritic rats. International Immunopharmacology Volume 12, Issue 1, January 2012, Pages 205-211. Vuorelaa M, Leinonenb M, Saikkuc P, Tammelaa P, Rauhad JP, Wennberge T and Vuorela H. Natural products in the process of finding new drug candidates. Curr Med Chem 2004; 11(11): 1375-1389. Gupta LM and Raina R. Side effects of some medicinal plants. Curr Sci 1998;75: 897-900. Basu S, Acharya S, Bandara M and Thomas J. Agronomic and genetic approaches for improving seed quality and yield of fenugreek (Trignella foenum-graceum L.) in western Canada. In: Proc. Science of Changing Climates-Impact on Agri., Forest. Wetlands, Univ. of Alberta, Edmonton, AB, Canada, 2004, pp. 38. Passano P. The Many Uses of Methi. No. 91(November-December 1995) MANUSHI. Available online at: www.manushi-india.org/…/nutrition_methi.pdf. (Accessed March 18, 2013). Gabay, Odile, et al. “Stigmasterol: a phytosterol with potential anti-osteoarthritic properties.” Osteoarthritis and Cartilage 18.1 (2010): 106-116. Moghadasian, Mohammed H., and Jiri J. Frohlich. “Effects of dietary phytosterols on cholesterol metabolism and atherosclerosis: clinical and experimental evidence.” The American journal of medicine 107.6 (1999): 588-594. Abdel-Moein, N. M., et al. “Evaluation of the anti-inflammatory and anti-arthritic effects of some plant extracts.” grasas y aceites 62.4 (2011): 365-374. Andersen, Monica L., et al. “Evaluation of acute and chronic treatments with Harpagophytum procumbens on Freund’s adjuvant-induced arthritis in rats.”Journal of ethnopharmacology 91.2 (2004): 325-330. Grant, L., et al. “A review of the biological and potential therapeutic actions of Harpagophytum procumbens.” Phytotherapy Research 21.3 (2007): 199-209.